Turkey's President Recep Tayyip Erdogan, gestures as he delivers a speech during a ceremony to rejoin the ruling Justice and Development Party, or AKP, in Ankara, Turkey, May 2, 2017. Turkey could be seeking to play Moscow off Washington, according to some analysts, as President Recep Tayyip Erdogan is set for separate meetings this month with Russian President Vladimir Putin and U.S. President Donald Trump. Putin will host Erdogan Wednesday in the Black Sea resort of Sochi. That meeting comes at a critical time with rapprochement efforts stalling. 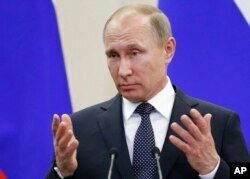 Russian President Vladimir Putin gestures as he speaks to the media after his talks with German Chancellor Angela Merkel at Putin's residence in the Russian Black Sea resort of Sochi, Russia, May 2, 2017. The conflict in Syria continues to dog relations between the two regional rivals, which back opposite sides in the civil war. The past few months saw the leaders meet a record four times as part of rapprochement efforts after Turkish jets downed a Russian bomber operating from a Syrian airbase. But those efforts stalled over Moscow backing the Syrian Kurdish militia YPG, which is widely viewed as the most effective force in fighting the Islamic State in Syria. “Erdogan will raise his unhappiness at Sochi over the YPG,” predicts analyst Ulgen. Ankara considers the YPG a terrorist organization linked to the PKK, which is fighting the Turkish State for greater autonomy. Ankara was infuriated when Russian soldiers were deployed in the Syrian Kurdish canton of Afrin in a move widely seen as a deterrent to Ankara. Until the deployment, the Turkish army, which is massed across the border, had regularly bombarded the YPG in Afrin. Ankara has similar grievances with Washington, which has deployed its forces on the Turkish border in the Syrian Kurdish canton of Kobani, following last month's Turkish airstrikes against the YPG. Erdogan is scheduled to meet Trump at the White House in two weeks. Ankara's recent courting of Moscow has caused concerns among its NATO partners over its future commitment. “A NATO without Turkey” would be “less strong,” NATO secretary General Jens Stoltenberg warned last month. But analysts point out that despite Erdogan's recent courtship of Moscow, he has little to show for such efforts. Erdogan also appears to have few cards he can play to persuade Putin to abandon his support of the Syrian Kurds. "Russia knows Turkey very well. Turkey does not have a foreign policy. It has one night stands," claims Yesilada. "One day we are allies with Russia, then the next day Trump bombs the Syrian airbase, [and] we immediately rush to Trump's side. Russia understands Turkey is an opportunist. While Turkey changes its policy everyday, Russia is very careful about loosening the noose around Turkey's neck. We've normalized relations with Russia, but Russia hasn't." Moscow has eased just a few of the tough economic sanctions imposed on Turkey after the 2015 downing of its fighter jet. Erdogan is expected to raise the issue with Putin in Sochi. But the Turkish president likely will be relieved that Russian tourists are starting to return to Turkish resorts after last year's travel embargo. This photo made from the footage taken from the Russian Defense Ministry official web site on Nov. 27, 2015, shows Russian S-400 air defense missiles being deployed at the Hemeimeem air base in Syria. The sale of Russia's S-400 surface-to-air missile system is predicted to be discussed. “A joint decision will be made on the forthcoming steps toward the acquisition of the system,” predicted Turkish Defense Minster Fikri Isik. The purchase of the S-400 is widely seen as Ankara sending a message to its western allies that it can look both east and west in military matters. Putin likely will be only too happy about any discomfiture in NATO over talk of Ankara buying the S-400. Analysts question whether Moscow would ultimately sell such a sophisticated system to Turkey, however, given that the two countries remain rivals with a host of unresolved tensions that are unlikely to be fully resolved in Sochi.